Hey everyone! Happy Friday! Do you guys see a slight pattern here?! I think I'm in Halloween or Fall spirit haha! 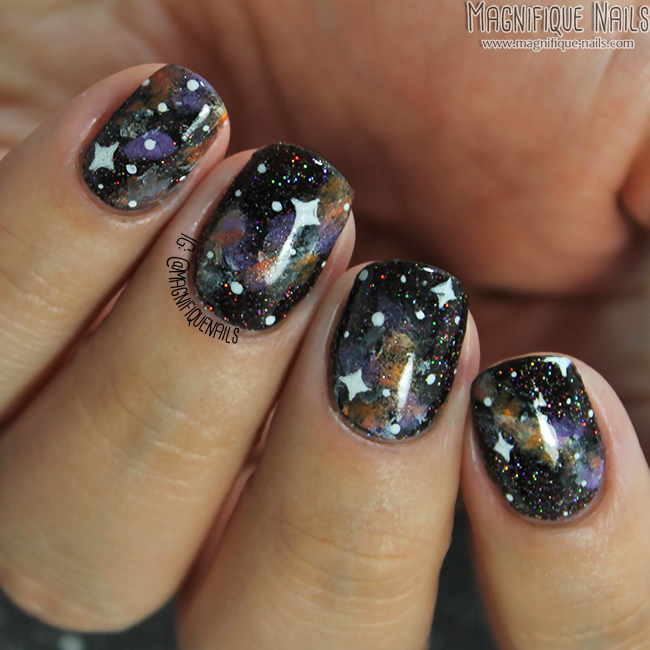 This has to be my most favorite challenge, the galaxy nails. 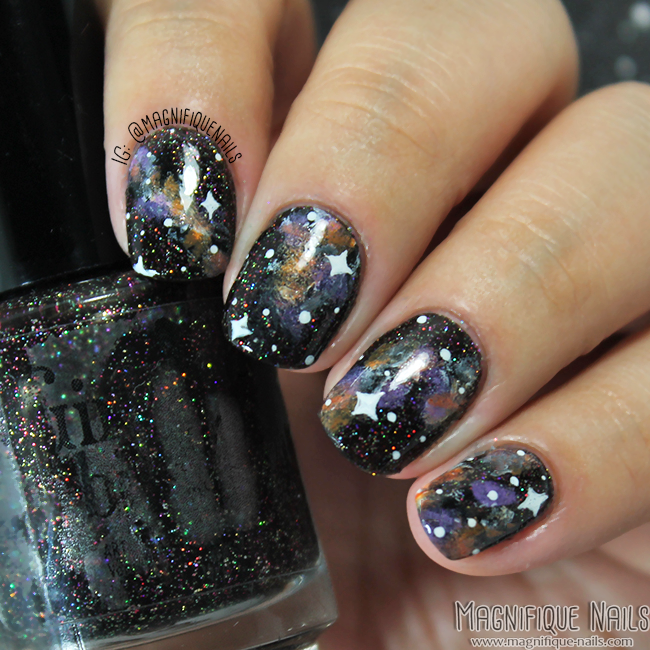 I looove galaxy nail art designs, they are so much fun to do. It was probably one of the first designs I created when I started my nail art journey. Even though I've created many different types of galaxies, it is infinite when picking the colors you choose and how creative you will go. So when brainstorming I wanted to stick with the Halloween colors, considering it is just around the corner. Either way it gave me an excuse to, finally, use one if my favorite nail polish... holy holos! I mean look how the base sparkles, it is absolutely amazing! Even better under natural daylight. Normally I would add a coat of glitter top coat, but this beauty does all of the work! As for the design, I began by applying two of Girly Bits Cosmetics Into the Night. 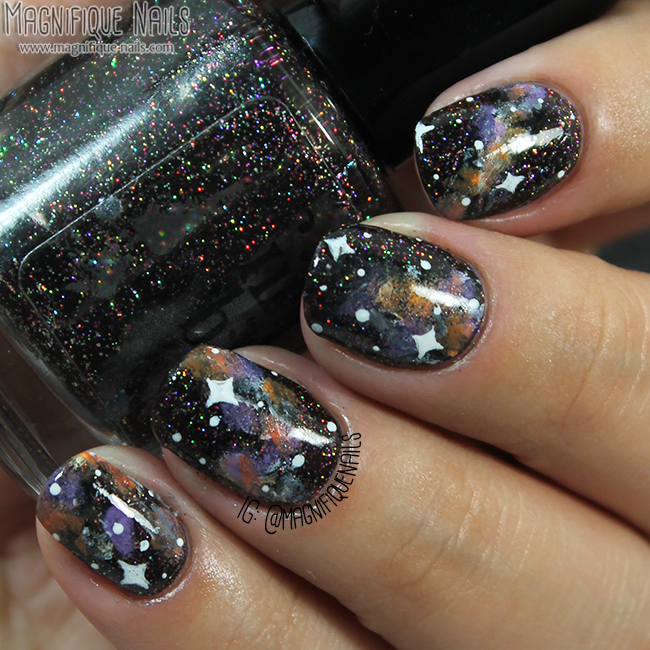 Which is a jelly base, packed with colorful micro glitters throughout the polish. 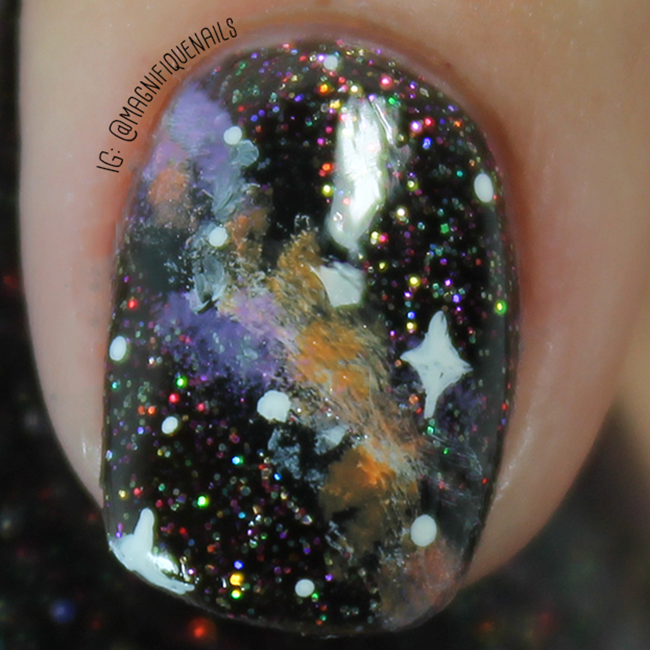 Once the Polish was completely dry, I them lightly dabbed the colors creating the galaxy, with a make up sponge. The colors I used is Sally Hansen Sun Kissed, Revlon Enchanting, Bonita Cocktails and Carving and black and white acrylic paint. Once that was set, I then added a few dots with a small dotting tool, and the stars with a nail art brush. I used white acrylic paint. Lastly, I sealed the design with H K Girl Top Coat, that's it! Heck, they even would look amazing matted! I absolutely love how these came out. I really didn't want to remove them.